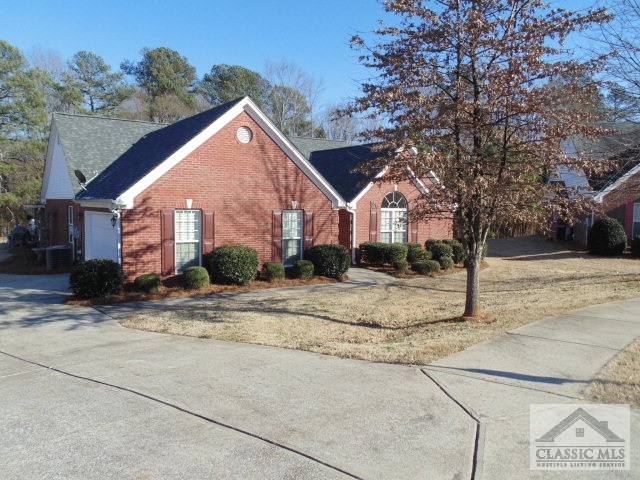 Beautiful one level 4-sided brick ranch with open plan and large lot and side entry garage in Winterville. Roof is less than 1 Year Old. Features include Large vaulted great room with fireplace, large sun-room, formal dining room, breakfast room. The kitchen has an Island with breakfast bar, spacious cabinets, wood floors, formica countertops with wood bullnose edge, plenty of lighting tile back splash and a serve through passage to the great room. Cable in the subdivison. Large yard with automatic sprinkler system. Backyard has large garden area, trees line the rear of the yard. Aluminum cover remains with the house. Thomas Farms is a subdivision within the city of Winterville, Georgia. There are currently 0 Homes for Sale within Thomas Farms, with asking prices ranging from $0 to $0. The average list price per square foot of the available inventory in Thomas Farms is $0, which is the Winterville average of $168. The Average Sales price of all sold real estate in this subdivision for the past year is $230,000. Recent comparable homes have been selling for 98.36% of their asking price. Waterfront homes represent of the available Thomas Farms inventory. The population of Winterville, according to the 2010 Census, is 1,122. The total number of households in the zip code of Thomas Farms is 2,625, with an average household size for of 2.57 people. The total number of renter households within the zip code of 30683 is 628, which means that 76.08% of households in this zipcode are owner occupant households. 269 Taylor lane, Winterville GA 30683 is a Home, with 3 bedrooms which is recently sold, it has 2,437 sqft, .51-1 sized lot, and Attached parking. A comparable Other, has bedrooms and 0 baths, it was built in and is located at and for sale by its owner at $ 0. This home is located in the city of , in zip code , this County Other, it is in the Subdivision, and Carlton Place are nearby neighborhoods.